In their quest to prove the existence of discrete pore-like ion channel proteins in cell membranes, Bert Sakmann and Erwin Neher developed the patch clamp electrophysiology method in 1976. This technique allows the direct recording of tiny ionic currents in either a patch of, or the entire cell membrane, via a glass microelectrode and is capable of resolving single ion channel gating events on the sub-millisecond time-frame1. Unsurprisingly, patch clamp electrophysiology rapidly became the cornerstone of ion channel biophysics and molecular neuroscience and Sakmann and Neher were later awarded the Nobel Prize for Physiology & Medicine in 1991. In the pharmaceutical workplace, the patch clamp method soon became a stock part of the ion channel pharmacologist’s armoury. The basic component parts of a patch clamp amplifier, inverted microscope, micromanipulators, anti-vibration workstation and microcomputer can be assembled for less than £40K and used to profile the effects of compounds at either heterologously-expressed recombinant or native ion channels. Our current understanding of the detailed molecular mechanism of action of many important drugs owes much to this approach. For example, nifedipine inhibits the pore of voltage-gated L-type Ca2+ channels in vascular smooth muscle and the myocardium to produce its antihypertensive effects and benzodiazepine anxiolytics such as diazepam act as allosteric positive modulators of GABAA-gated Cl- channels in the central nervous system. To this day this method remains the ‘gold standard’ for this type of analysis. Despite this, patch clamp electrophysiology has never truly made it as a frontline, primary drug screening tool. Because of the requirement for single cell visualisation and delicate microelectrode manipulation, even an experienced electrophysiologist can at best screen 2-3 compounds per day. This is clearly insufficient to keep pace with the speed and throughput requirements of a modern medicinal chemistry team, let alone support compound library or full diversity screening where several hundred thousand samples may require profiling. Consequently, faster but indirect assay methods such as ion flux with radioisotopes or fluorodetectors, membrane potential measurements or radioligand binding have been deployed, with occasional ‘spot checking’ of compounds by electrophysiology. Whilst this has been reasonably successful for some ion channels, the inability of these alternative approaches to provide a true temporal, linear readout of function – and in the case of voltage-gated ion channels a true gating stimulus – can often lead to false positive (or worse still false negative) outcomes and confounding structure-activity relationships. In the extreme, some mechanisms of drug action such as use-dependent block of voltage-gated Na+ channels that underlies the efficacy of many clinically used anticonvulsants, anti-arrhythmic and local anaesthetic drugs cannot be reliably quantified by any method other than patch clamp electrophysiology. These factors, coupled with increasingly widespread recognition across the pharmaceutical industry that ion channels represent an under exploited opportunity for new therapeutics, were the main drivers for the development of new higher throughput systems. The first commercially available automated patch clamp systems such as the Neuropatch (now Apatchi – Sophion Inc) and Autopatch (CENES, now Xention) were released between 1996 and 1998. Each reduced the requirement for operator skill by using motion controllers and feedback circuitry to automate pipette manipulation and the subsequent formation of a high resistance (>1GΩ) seal between the pipette and the cell surface – a key requirement for high quality recordings. Whilst the Neuropatch system was based around an inverted microscope as in conventional electrophysiology, the Autopatch made ‘blind’ recordings from cells in suspension by inverting the electrode and using a combination of gravity and negative pressure to locate a cell at the meniscus of a droplet of buffer (the ‘Interface’ patch). With software controlled drug application, each system proved capable of unattended operation from the start to the finish of a drug screening experiment. However, since they were based on recording from a single cell at a time neither significantly improved overall screening throughput. An alternative approach has been to use the amphibian expression system of Xenopus Oocytes for rapid electrophysiology. These extremely large cells (1-2mm diameter) can be easily microinjected with cDNA or mRNA encoding the ion channel of interest and then voltage clamped using two microelectrodes. Electrode positioning for microinjection and recording does not require microscopy and thus more naturally lends itself to automation. Following automatic microinjection, the Roboocyte instrument (2001, MultiChannel Systems) allows sequential recordings of up to 96 oocytes on a plate. The OpusXpress platform makes eight parallel recordings (2002, Axon Instruments now Molecular Devices). Each system claims to increase drug screening throughput by 10-20-fold against conventional oocyte two electrode voltage clamps. While this may be true, these estimates rely on high success rates with microinjection and recording, which is often not the case and multiple drug applications to the same cell. In random drug screening many compounds do not readily washout from the cell and this can drastically decrease the opportunity to apply further compounds. The greatest limitation for many industrial pharmacologists is the fact that substantially lower compound potency is often observed in the oocyte expression system compared to mammalian cells and this is likely due to the large phospholipid content of the cell surface which can act as a ‘sink’ for lipophilic drugs. Nevertheless, these automated platforms have proved extremely useful for accelerating structure-function studies on ion channels by enabling numerous channel chimaeras or single point mutations to be rapidly characterised2. Instruments capable of patch clamp recording from many mammalian cells in parallel have only come to the market in the last four years. The significant breakthrough was the finding that ionic currents could be measured from a cell positioned over a small aperture (1-2μM diameter) in an inert polymer, silicon or glass substrate, thus obviating the need for micropipettes3,4. Whilst this principle was first demonstrated in the mid 1970s5, the wherewithal to mass produce plates or chips containing these holes at a price that was viable to the end user (<$1-10 per recording) only became possible later on. Each of the main systems works on the common principle of first pipetting cells in suspension into a number of recording wells and attracting a single cell to each recording hole using microfluidics and/or suction from below. Once the cell has formed a high electrical resistance seal with the substrate, electrical access to the cell interior is obtained by either applying further suction to rupture the membrane patch (‘whole-cell’ recording) or via perfusion with a permeabilising agent such as amphoterocin (‘perforated-patch recording). Voltage clamp and current recording from multiple wells are achieved by parallelisation of electrodes and amplifier circuitry. The PatchXpress, designed by Axon Instruments (now part of Molecular Devices Corporation) enables up to 16 parallel recordings to be made on a single ‘seal chip’. A single pipettor applies compounds to each recording well from a 96-well microtitre plate. Sophion (QPatch-16) and Nanion (NPC-16p) also have 16-channel parallel devices that rely on pipettors and microfluidics to apply drugs to cells. All three systems make tight seal GW recordings and retain most of the functionality of the conventional patch clamp, including capacitance and series resistance compensation and highly flexible voltage command. In addition, they all employ an ‘on demand’ drug application protocol, in which compounds are dispensed only when the biological signal in a given cell is stable. This ensures that drugs are only screened on ‘good’ cells. The overall success rate for recording and drug application at each position is 40-70% depending on the cell line, instrument and experimental design. In some cases, several drugs or different concentrations of the same drug can be tested if the cell remains viable. Whilst this design maximises the information that can be obtained from a given recording, for medium throughput drug screening it does complicate data analysis and reduction, in that each cell must, to some extent, be treated individually. As noted for oocytes, it is difficult to achieve the theoretical throughput of these instruments since many compounds are either slowly reversible or irreversible with washout and thus repeated drug application can be limited. ‘Real world’ estimates of drug screening throughput increases compared to conventional electrophysiology are in the region of 3 to 10-fold. 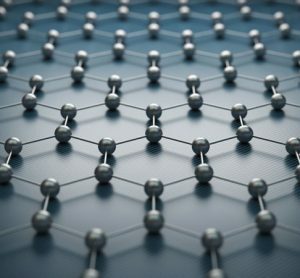 The IonWorksHT platform (Molecular Devices Corporation) tackles the challenge of increasing throughput somewhat differently and is more akin to established microtitre-based screening methods. Up to 384 single cell recordings are made on an individual ‘patch plate’, via an electronics head that reads in blocks of 48 wells. Whilst the seal resistances of 100-400MΩ achieved are lower than with other machines (1-10GΩ) and capacitance and series resistance compensation are not possible, for medium throughput drug screening these differences are of little if any practical significance. Compounds are applied from a 96-well microtitre plate according to a pre-determined schedule, as opposed to on demand and each compound well is applied to four different patch wells. This design compensates for when individual recordings are either unsuccessful or the selected cell expresses insufficient channels to measure. If the probability of success in a single patch well is 75% the statistical likelihood of compound addition to one or more good cells exceeds 98%. The total plate read time is generally <50min and routinely more than 2500 cells can be recorded from in a day. This corresponds to >600 different drugs at a single concentration or 60-70 full concentration-response curves. One limitation of the system is that drug addition and recording are not made simultaneously thus screening desensitising ligand-gated channels is not possible. Another is that, due to the high leak conductance, configuring assays for background ‘leak’ ion channels can be challenging. Nevertheless, for the large majority of channels that can be studied, this platform offers a truly quantal improvement in throughput over conventional electrophysiology. In an exciting development, Molecular Devices recently launched a new instrument named IonWorks Quattro that works on a novel principle of ‘population patch clamping’. In each well 64 holes are formed and, providing that a high fraction of holes are occupied, the ionic current measured is the sum of the currents from the individual cells. Thus, a highly homogeneous signal is obtained across the plate. ‘Success’ can rise to very close to 100% and data quality is markedly increased. It becomes unnecessary to add each compound to four wells and with 1:1 transfer true 384 (compound) well functionality is achieved. At up to 4x faster than the original machine, throughputs of >2000 drug data points per day should be readily achievable. Three other commercially available electrophysiology systems are worthy of note – not so much for reasons of throughput, but for inventive design or useful functionality. Flyion offer a method (‘Flip the Tip’) that places cells in suspension inside a glass pipette to attain whole cell recordings, thus dispensing with microscopy and pipette manipulation. The Port-a-Patch NPC-1 from Nanion is a neat benchtop instrument that has most of the functionality of a conventional patch clamp rig, including cell attached single channel recording and drug addition to the internal face of the plasma membrane. Both of these can be useful in compound mechanism of action studies. Finally, Cellectricon have engineered an ultra rapid drug application method based on laminar flow microfluidics that facilitates the study of fast ligand gated ion channels. Several big pharma, biotechnology firms and contract research organisations have now acquired higher throughout electrophysiology systems and have begun to integrate them into their work flow. In some cases, these instruments simply speed up an existing process and serve to alleviate a drug discovery bottleneck, but in others the technology has proved to be truly enabling. Selecting and optimising ion channel transfected clonal cell lines for drug screening, for example, can now be transformed. Previously, non-linear or semi-predictive methods of function such as RT-PCR, FACs and Western Blotting were used to select on average two to three from several hundred transfected clones for true functional analysis by electrophysiology. Patch clamp studies were conducted on a small number (10-20) of cells from each clone to verify function and provide some indication of the level of expression and the proportion of cells that were transfected. Now, using the IonWorksHT hundreds of cells from all clones can be readily tested such as to reduce the clone selection process to genuine population statistics by (linear) function. Moreover, it becomes facile to explore the impact of different growth conditions (e.g. media, serum, cell confluency) on expression to further optimise the final screening reagent. Significant improvements in the quality of the downstream assays are observed as a consequence. Screening focused libraries and small arrays against ion channel targets by electrophysiology is now possible. The greatest impact here has been in the voltage-gated ion channel field, where alternative assay methods have always proved unsuitable for SAR and for targeting specific mechanisms of action. Compound sets of up to several thousand can be profiled in the higher throughout systems using protocols that can identify pharmacological phenomenon such as open channel block, use-dependence, slowed deactivation etc. Where much larger compound sets are being screened (i.e. true diversity HTS), the alternative ‘indirect’ assay methods are still required. However, the hits from these screens can now be validated and characterised by electrophysiology far more rapidly than before. At the stage of hit series expansion (i.e. compound sub-structure & analogue searching) electrophysiology can also be used. Importantly, the higher throughput platforms provide sufficient capacity and speed for the technology to be used as a frontline screening approach to support medicinal chemistry and iterative SAR. In terms of ease of use and throughput, the new Quattro system will bring the electrophysiology drug screening paradigm ever closer to that of cell based fluorescence screening (e.g. FLIPR), which has been the mainstay HTS platform for G-protein coupled receptor targets in many pharmaceutical settings. A very common and high profile application of these systems is for screening compounds at the h-erg K+ channel. Indeed, h-erg data has been presented at recent conferences by vendors and/or users for almost every system and has become a key part of instrument validation. Inhibition of h-erg can lead to prolongation of the QT interval in the electrocardiogram and a potential fatal arrhythmia known as Torsades-de-pointes and has been implicated in the withdrawal of many drugs from the market for cardiotoxicity6. Whilst previously h-erg electrophysiology studies were only conducted on greatly advanced compounds (i.e. at candidate selection or to GLP prior to first time in man) the increased capacity and speed that is now available enables h-erg profiling to be conducted much earlier in the drug discovery process. Other voltage-gated ion channels that are critical to cardiac function and may represent a toxicity risk, such as NaV1.5 and KCNQ1+minK, may also be screened earlier on. 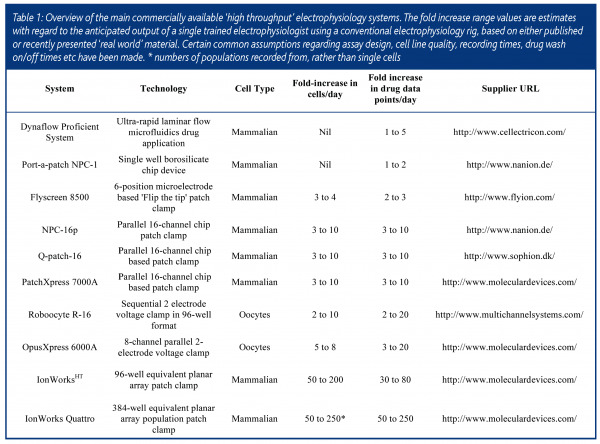 High throughout electrophysiology technology is evolving rapidly and the next few years promise further advances in speed, capacity and functionality. Two main limitations of existing instruments – notably the lack of ultra-fast drug application for ligand-gated ion channels coupled to a quantal throughput increase – and the cost of the consumables (>50c-1$ (US) per well), will almost certainly be addressed. The population patch clamp principle employed in the IonWorks Quattro is an example of a technical breakthrough that could permit a further quantal increase in throughput, which may ultimately enable true ion channel electrophysiology HTS. Whatever the case, the rich opportunities for therapeutic intervention provided by the ion channel genome will become ever more exploitable as a result of the greater tractability that these methods provide. The author wishes to thank several key co-workers at GSK, notably Claire Townsend, Tim Dale and Wolfgang Jarolimek for their valuable input and debate on the subject of electrophysiology screening methods.